Want to make your little girl feel as pretty and special as Oz's famous Dorothy? Well, that's easy. 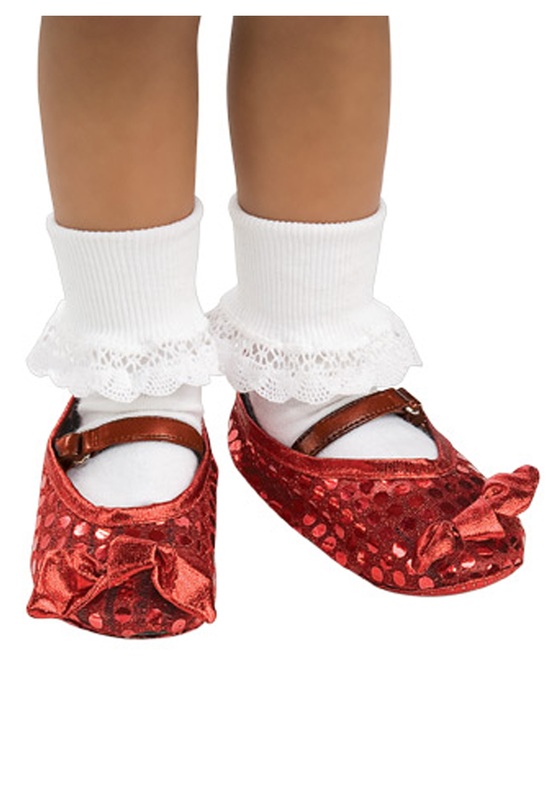 There's no need to wait for another house to fall on another witch to finally achieve that classic Dorothy look, just grab these adorable Ruby Shoe Covers. Once you slip these red sequin covers over any pair of shoes your youngster is already comfortable running around in, she'll be ready for the adventure of a lifetime! She may not have the power to click her heels together three times and magically wake up back home in her bed but that won't be a problem. When she's wearing these shiny shoe covers, she won't ever want her dreamy escapade to end! We can't guarantee that she'll make friends with an animated scarecrow, a romantic tin man, or a loudmouthed lion. However, we can guarantee that she will feel like the heroine of an enchanting storybook tale when she's strutting around town with these Ruby Shoe Covers strapped around her feet!